Wraparound Jacket with Rowan Spray by Erika Knight. 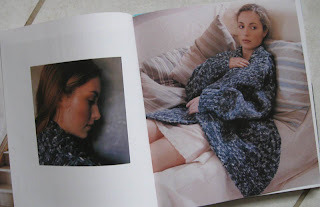 A few months ago, I lucked up on a knitting book, Classic Knits by Erika Knight, at my local Tuesday Morning store. It was $5.99—a bargain even if I made just one of its 15 projects. I went to my stash and pulled out several balls of Rowan Spray. Of course, I had about 4 different colorways, but not enough of any one to make the entire project (isn't that always the way??). 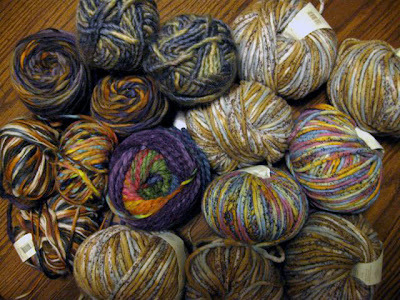 Taking the colorway of the called-for yarn that I had the most of, I pulled other yarns from my stash to mix with it. 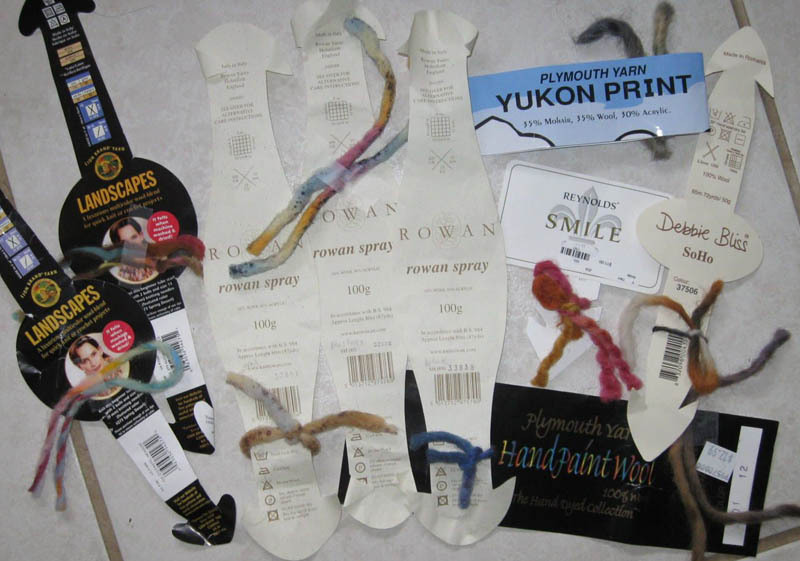 Seven different yarns in mostly neutral and earthy tones were initially chosen to participate. The fiber content was predominately wool. The sample swatch using the A-B-C color sequence indicated everyone played well together. On to the knitting: With a size 13 circular (I'm a loose knitter), I cast on for the back. 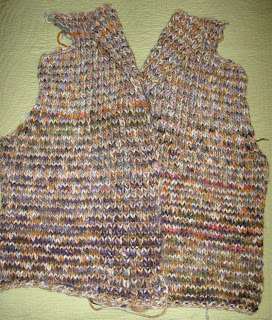 The two fronts were next, followed by the sleeves. 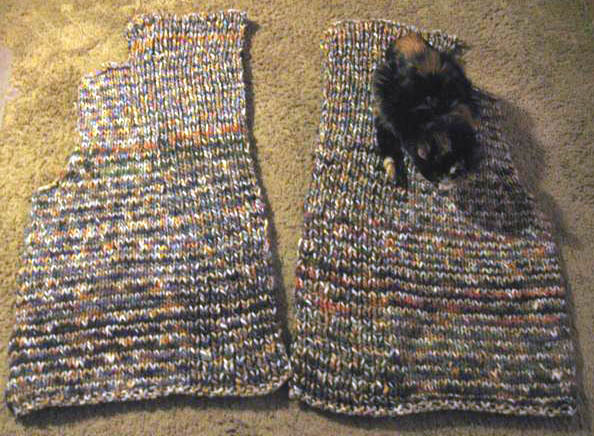 I wound the yarn into multiple balls, to insure a similar blending sequence for both the back and front. My Knitting Inspector assisted. Left and right front sections. The knitting went quickly—all stockinette with 1 x 1 ribbing at the collar. I was able to finish each piece in about 2 evenings. Unfortunately, the garment patterns in this book do not have schematics, and the photos did not show 1.) 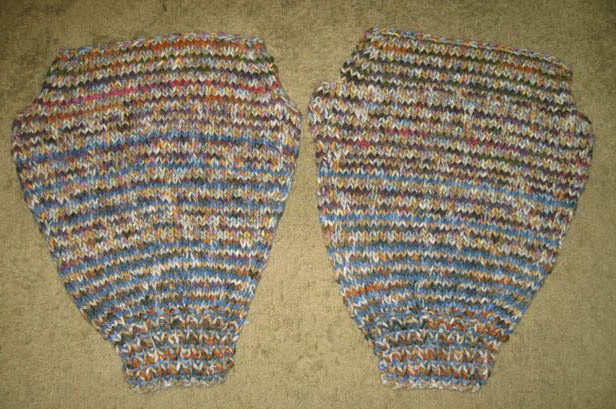 a back view of this sweater, nor 2.) a view with the model standing up (she was always lounging in a semi-seated position). A real disappointment. I wonder if all of Erika Knight's patterns are void of a schematic. 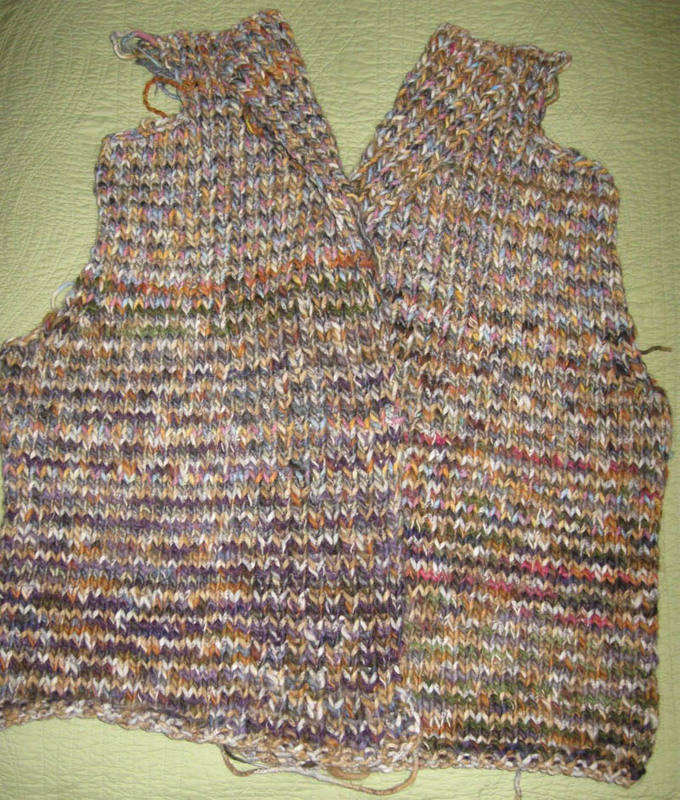 The partial skeins of the various yarns disappeared quickly and I needed to add other yarn when it came time for the sleeves. A blue colorway of the Rowan Spray (not shown in the original photo) was added and I unravelled a previous UFO to gain more of the variegated Reynolds Smile yarn. Additional blue yarn and UFO that gets unravelled. The sleeves have more blue coloring, but still blend well with the rest of the sweater. I like the bits of burnt orange and pinks from the Reynold's Smile. 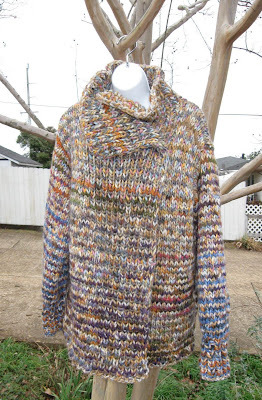 All in all, the Stash Buster Sweater Coat turned out well. 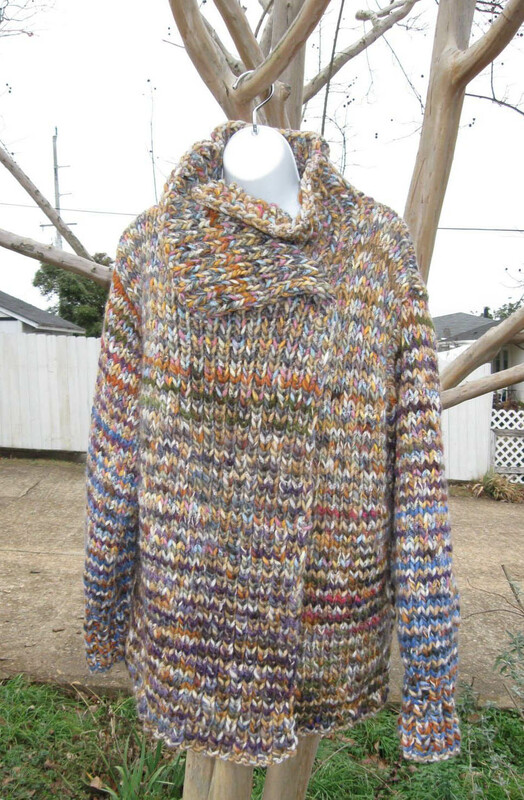 The sweater is comprised of many yarns. 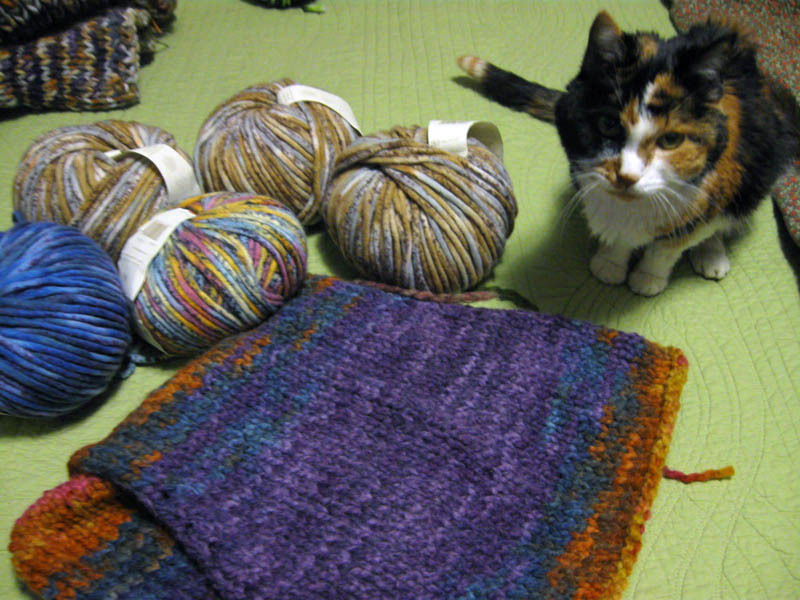 The A-B-C yarn sequence worked like a champ. The final tally of different yarns used (those that still had their ball bands, anyway) was nine. NO NEW YARN was purchased for this project (and the book was even a marked-down price). Yay! Here is the finished piece. It is very warm and snuggly. A belt would serve it well and pockets would be another good addition.